Windows XP is a much more stable system than 95/98 or ME. The system file checker for XP takes a considerable amount of time and you really don't want to run it unless it is obvious that the O/S has become unstable. Please use SFC for XP ONLY when necessary! Type in cmd and then press ok, see the graphic to your left. This will open the MSDos Window shown below. 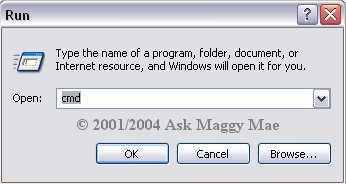 Your window will not have Maggy of course. The window to your left will appear on your screen. 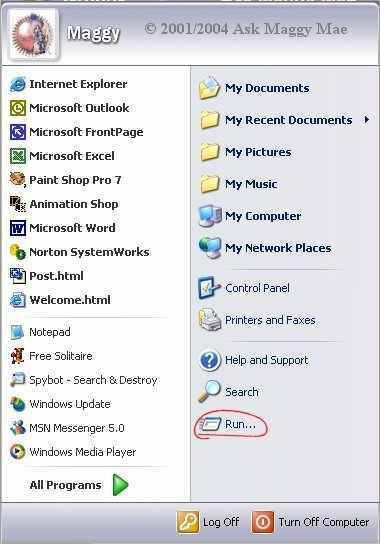 If all the needed files are not on your computer you will be prompted as in the graphic below. Place your CD into the CDRom drive and this window will disappear. Bringing you back to the window above and the one below. If you like you can close down your MS Dos Window now. Finally, this window will disappear when the sfc has finished it's job. There is nothing more you need to do.